I made this recipe for the first time in January 2003 and I marked it as being “Excellent” at that time. it was just as good this time, as it was then. At least I thought so. It’s hard to find one meal to feed five people and have all five people like it. It almost never happens. Very rarely anyway. My goal is basically to find one meal that everyone at least likes one part of. Last week though, I thought I had a winner. I was shooting for at least four out of five “likes” on this one. It was a recipe I’d first made years ago, out of the “Better Homes and Gardens New Dieter’s Cookbook” in 2003, and we loved it. I’m sure I’ve made it since then, but not recently and not since we’ve had all three of the girls. None of them remembered ever having it before. Liz I was pretty sure on, and Caroline I was pretty sure wouldn’t like it. She hates apple juice, but I was hoping maybe the rest of it would win her over. Alex though, was a sure thing. 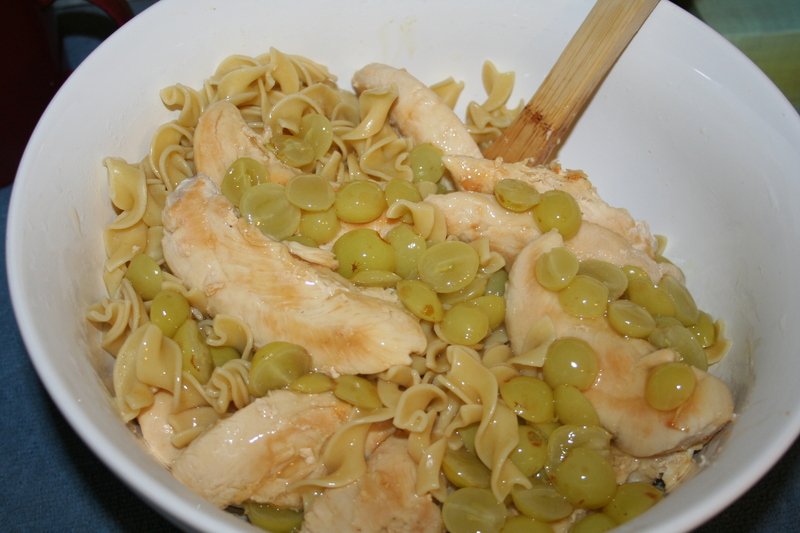 I had considered the ingredients as always, when planning the meal: chicken, pasta, grapes and apple juice. She likes the pasta, the apple juice and the grapes. All those things, a lot. I served the meal. I sat back. I waited. Don liked it, I liked it, Liz was fine with it, but I couldn’t wait to get Alex’s review. I was expecting two thumbs up. And this is where the dash of karma comes in. I hate when my food touches. If you look back at all my recipe posts, you can always tell when the dish being photographed is mine because the food is all spread waaayyyyy apart on the plate. She’s already a mini-me. This just seals the deal. Her food can’t touch. I’m so doomed. In any case, the dish is really yummy, as unusual as it sounds. You can use any color grapes or a mix of more than one color. I had green so that’s what I used. Here is the recipe. Give it a try. 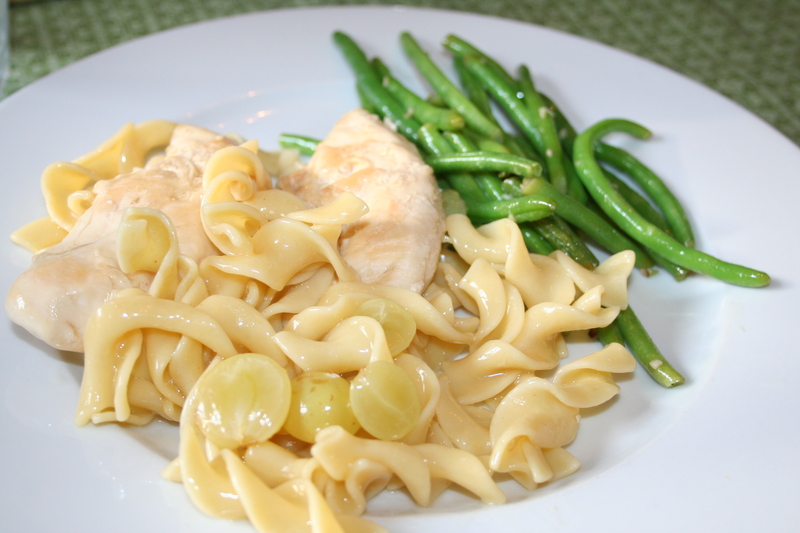 4 small skinless, boneless chicken breast halves (12 oz. total) *I used chicken tenders. Fresh herb, such as oregano or thyme (optional) *I opted out. 1. Rinse chicken; pat dry with paper towels. Spray an unheated large skillet with nonstick coating. 2. Preheat skillet over medium to medium-high heat. Add chicken. Cook for 8-10 minutes or until tender and no longer pink, turning to brown evenly. Remove from skillet, keep warm. 3. 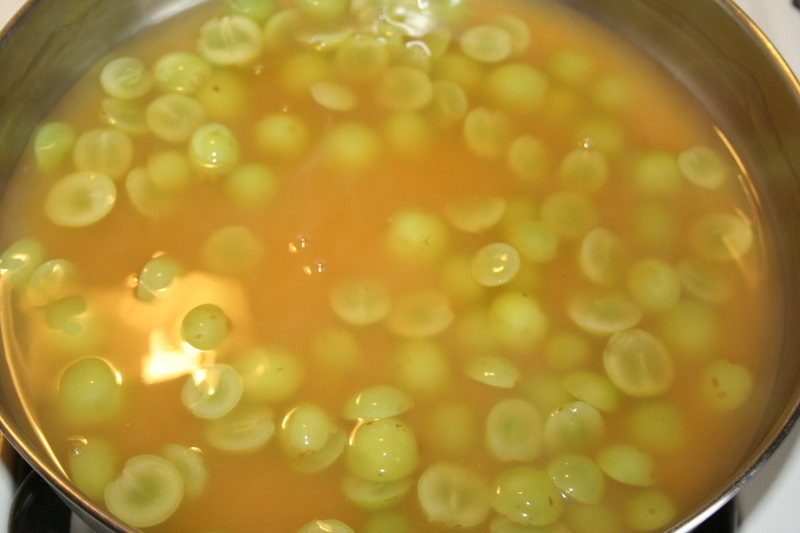 Meanwhile, combine grape or apple juice or cider, bouillon granules, and cornstarch. Add to skillet. Cook and stir until thickened and bubbly. 4. Cook and stir two minutes more. Stir in grapes; heat through. Serve over chicken. 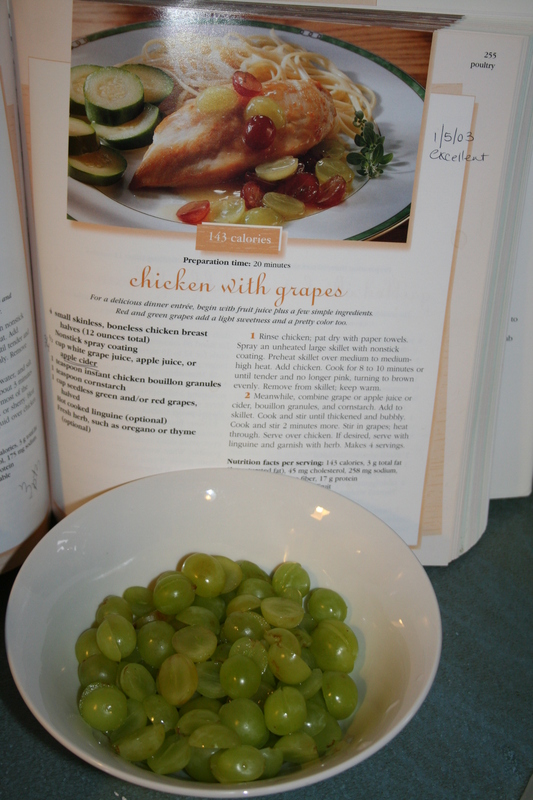 I never would have thought of using grapes that way… nice recipe! Me neither. That’s why I like cookbooks with pictures. If I hadn’t seen it I don’t think I would’ve tried it. It sounds too unusual, but it’s really good! You r making me smile once again! I’m doing my very best! It is indeed a must try healthy recipe. I wanna try this at home. Your recipe looks very healthy and delicious. I hope I could try it one of these days. Thanks!